NwaVic: Your Plan, His Plan? Happy Tuesday people! I hope you are having a good week. My week has been very productive so far, so I'm feeling very swell right now. Anyway, today, I have to share with you my favorite Bible verse. This is the mantra of my life and I love waking up every morning knowing this. In fact, if God forbid I am ever made to get rid of my Bible, I’d tear whatever page this verse was on, and hide it in my bra. That’s how much I love it. Ok, point made. I included 3 versions of this verse to denote the significance of this promise. It makes for an easier application to your everyday life. 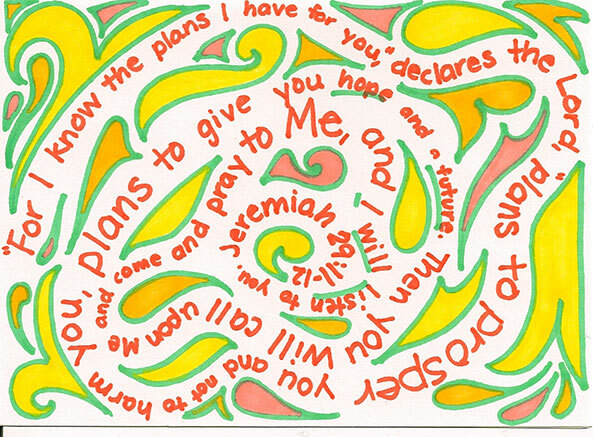 This verse is very special to me because anyone who knows me well knows I'm a “lets plan it” gal. I don't like last minute things. If I want it to happen, I plan it ahead of time. I like things black and white. It is or it isn't. That’s why I don’t like open doors. Really. Call me weird but my sisters will tell you the heat they get every time they 'visit' my closet and leave the closet door open. For me, closing a door signifies in some way something “set”. I plan and I do. That’s why I find it hard to procrastinate. Anything. If I planned to do it today, it will get done today. I like to think I’m in control of my destiny. Consider this: when I hear the much-dreaded words, “Change of plans”, my heart skips a bit. OK, you get the point. Maybe I’m a bit fond of control *covers face*. I just buy into the school of thought that, “if you want things done right, plan to do it yourself.” For most of my life, God has let me get away with it. I guess, because in the academic sphere, it works, most of the time. I planned to be a 20-year old college graduate. It happened. I planned to be a 23 year-old law school graduate. It happened. Yesterday, I planned to write at least 20 pages of my 40 page paper. I wrote 22 pages. But God has been teaching me a very specially personal lesson lately. I think I first realized this when I took the bar examination in July. All summer, I stuck to the schedule given to me by a bar prep course. I wrote it down and posted it on my bed frame. I had a copy on my laptop, my notebook and on my phone. From sunup to sundown, every minute was accounted for. As long as I was doing every single thing I was told, I was planning. As long as I was planning, I was in control of my destiny. And, I was content. This changed as soon as I dropped my pen on July 27. I then realized I had given up control of this crucial destiny of mine. I worried for weeks about certain undotted “I”s and uncrossed “T”s. But then I realized, there really isn’t anything I can do. Come November, it will be or it won’t be. My destiny is in the grader’s hands. But then I thought, “those graders are human beings too”. Trusting them is just as dicey as trusting myself. Then, I came across Jeremiah 29:11 and it seemed like it was singing melodies to my life. I am not almighty. Neither are you. We are merely passengers in God's SUV and it is important that we trust his GPS system. He controls our destiny, not us. When we try to drive our destinies, our clarity of direction is often smeared by our selfish human desires and what we “think” is best. As we as human beings have proved over and over again, even we, don’t always know what’s best for us. But imagine a wheel being turned by God? Picturesque. Velvety. Accident-free. I have been humbled by God’s message that He knows what’s best for me. He won’t lead me astray. He’s thinking about me and my future. He plans to give me a successful and prosperous future. He plans the same for you. I’m learning to give up the driver’s seat and I have greater peace. It’s like the burden is less, so is the stress and worry. We have all had the excruciating experience of failed plans. We want it our way, God says no or not now. 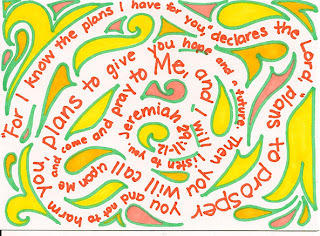 We plan, life interrupts...God is laughing and we think "How dare he? Its not funny. This is MY SHIP! I AM the captain!" 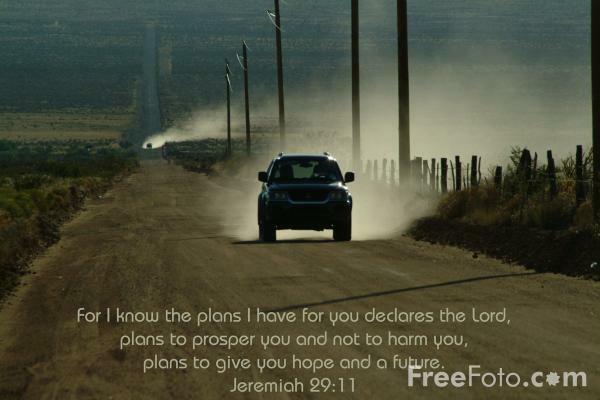 Jeremiah 29: 11 is an assurance that God got your back, and you can relax. God IS the Captain of our lives. He will take care of you, and me. What a relief! My mandate to you today is to let Jeremiah 29:11 speak to your life. Wear it as a wristband. Its not easy, I must admit, but its very liberating. Its shows trust for God and He likes to show off once He knows you have faith in His ability to drive you and do it well. In the words of Carrie Underwood, Let “Jesus take the wheel”. IOW, write down your plans in pencil and give God the eraser. Thanx for this. I love the comment by "anonymous"....That's absolutely the way to go, you are letting God know your desires but you are still giving Him to charge to let it be or not. Rali I esp love this "When we try to drive our destinies, our clarity of direction is often smeared by our selfish human desires and what we “think” is best". We all have to "let go and let God" for He knows best. Easier said than done tho! lol. But we should try. Ral I see a lot of write ups that's say, send this if u believe in God or something good will come to you. I often read it and ignore the sending part(even though I feel a sense of guilt) but this write up comes from within and I feel it. What I'm trying to say is, I am really touched by this and I really love the insight and lesson u are trying to show... Jeremiah 29:11.. I just registered that verse.